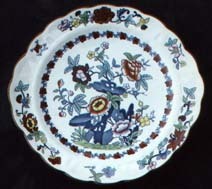 This striking floral pattern is derived from an identical pattern produced by Ridgway and other ironstone makers in the C19th. These older items usually bear a 'STONE CHINA' or 'JAPAN OPAQUE CHINA' mark in a scroll. The Booths version dates from around 1907 and is one of their longest-lived patterns, being in production for most of the first half of the C20th. The blue & white transfer is embellished with handpainted colours (green, yellow, blue, pink, red, purple) and brown rims. We have also seen a plain BLUE & WHITE version with no handpainting, but this is scarce. 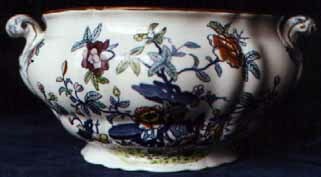 The teapot shown above is modelled on the famous 'Worcester' shape, also found in Booths patterns such as Battersea and Scale Blue. Jugs were produced in graduated sizes, in both the straight-sided 'sparrow-beak' and the 'Masons' shape shown. 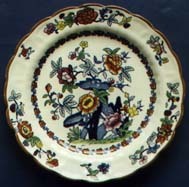 The shape of the plates and cups is the same 'Majestic' shape as Real Old Willow, characterised by the wavy edge present on plates and saucers. above and below a small crown. Sometimes the mark includes a registration number: Rd No 510607. Items bearing this mark rarely have impressed date stamps, and cannot therefore be dated with any certainty. The logo may have been used from the year of the pattern's registration - 1907 - until around 1920. 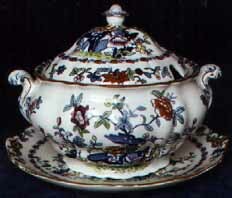 These early items are often thickly potted compared to more recent wares. We have seen items bearing this mark with date-stamps ranging from 1922 - 1935, although it is possible that the mark overlapped with the earlier LOGO shown above. Some items have a red painter's mark, which is the pattern number 8083, also found in conjunction with "The POMPADOUR" logo shown above. The pattern number A8026 supercedes the previous one (8083). Pattern numbers beginning with 'A' seem to have been introduced around the time of WW2, leading us to believe that these items were produced in the 1940s and 50s, and possibly later. It is not known if there was a gap in production during the war years. The later items are often more thinly potted. They may have crisper transfers and be less prone to crazing. These come in a range of sizes.